The popular children’s TV programme Blue Peter celebrates its Diamond birthday - a massive 60 years this year. We all have favourite memories and presenters - mine being John Noakes, Peter Purves and Valerie Singleton with their pet cat and dogs, including ‘get down’ Shep! I’m sure many of our childhood memories still resonate of projects using throw away items such as empty cardboard boxes, pipe cleaners, plastic bottles and not forgetting sticky back plastic. So, despite the current massive debate of recycling and up cycling, children have been helping by using these kitchen cast-offs for years. 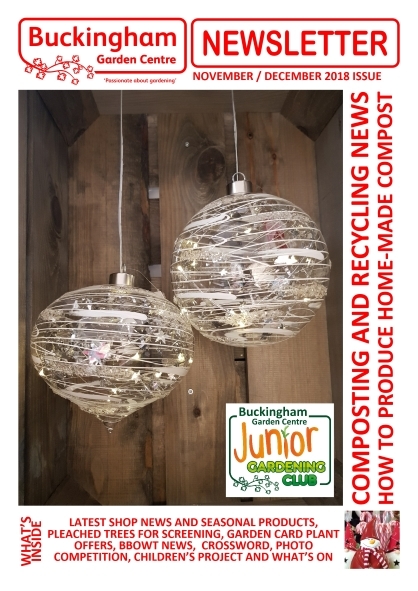 We gardeners, too, try to recycle our plant waste on the compost heap (pages 4-5), however the huge issues of one-use plastic and packaging means there is much to do in the future if we are help preserve our fragile planet. At the Garden Centre we observe a strict recycling policy with the re-use of cardboard boxes for carrying purchases from the till, to shredding newspapers and waste paper for packing our mail-order plants. Gardeners often save toilet rolls for germinating beans, peas and sunflower seeds in and I’ve seen a few net curtains utilised over allotment plots to keep out the dreaded cabbage white butterfly or low flying pesky carrot fly. We all can make a difference and remember however small these appear they can translate to a much bigger picture. Have a great Christmas and we hope to see you very soon. plant purchases too! Look over to the Customer Service Desk and you’ll see a rustic themed 4-metre-long swag wreath featuring some of the candy cane and woodland decorations. As you continue into the shop you will see a couple of themed areas, the Cool Christmas colours of champagne, clear and teal themed products including baubles, tree decorations, tree toppers, perfect for creating that Christmassy look. The aptly named glamour section features the metallic colours of gold, silver, copper and pewter, together with a wide array of home and tree decorations. You’ll find here our range of exclusively festive tinsels designed by the Team at the Garden Centre. These tinsels come in the following colour combinations (pictured right from top to bottom) - silver and pewter, copper and gold, silver and gold and last but by no means least candy cane. Turn the corner and you are immersed in our candy cane section, decked with the traditional colours of red and white, emerald green and dark blue. Extending through the shop we have a new range of festive homeware products including festive nut holders, plus fireplace art including reindeer, angels and stars. You’ll also find a great range of gift boxes, which are new for us this season together with wrapping paper, gift wrap bags and tags along with Christmas cards, calendars and crackers. Seasonal gift ideas include a lovely collection of novelty soaps in a selection of different fragrances and designs at £4.99 each and Christmas mugs for just 99p! These two items would make great inexpensive stocking fillers. 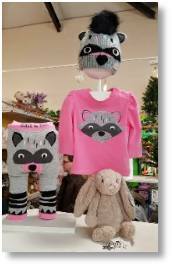 Our new range of children’s clothing is from the award winning ‘Blade & Rose’. Not only are the items a fantastic price, they are also made from high quality materials too! With 8 different designs to choose from, you will find the right one for your little one. Ages range from 0 to 4 years. The most popular items are the tractor, bunny and flower face designs and are already proving popular so they will make ideal Christmas presents! Why not check out ‘Blade & Rose’ for yourself next time you come to the garden centre – they are in the children’s area of the shop. Set within this area there are plenty of children’s themed toys, Johnsons Little Gardeners range, games and books. 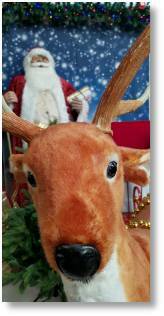 Look out for a great photo opportunity through the Christmas build-up as we are setting up a reindeer and sleigh set against a backdrop wall and inviting you to come along, take a photo on your phone and share your photos with us on Facebook. Each week through the Christmas period we’ll be giving a prize for our favourite photo, so keep an eye on our Facebook page for details! On display are winter reed diffusers from ‘Flame Homeware’ with scents like ‘Fireside Snooze’ and ‘Mulled Merlot’. There’s a perfume for every home this season. As you may know our Food Hall has increased substantially over the last twelve months as we’ve given more space to our popular suppliers Mrs Bridges and Cottage Delight. You’ll find their range of popular preserves, savoury and cheese snacks, festive treats, delicious relishes and gift hampers - perfect to indulge yourself as well as buying for loved ones. Elsewhere in the Food Hall you will find homeware, tableware, kitchenware, craft beers, local wines, artesan bread and handmade Fatherson cakes. 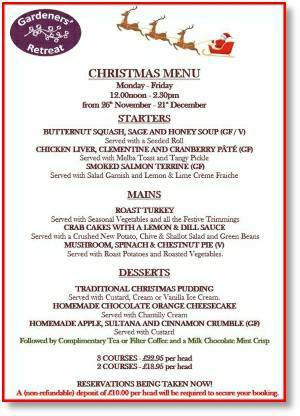 Christmas food is covered tastefully again this season with a full Christmas menu being offered in our Restaurant, see right. Booking is essential on 01280 827907. Our real Christmas trees arrive late November and will be beautifully shaped. They are sourced from the best Scottish growers and will include cut Nordmann Fir and Noble Fir which have excellent needle retention, provided you follow the care instructions. Finally, over the four weekends commencing 1st December and running up to Christmas we’ll have delicious mince pies and fruity mulled wine (fruit squash as a non-alcoholic alternative) available to all our Garden Centre customers. Ever since Sir David Attenborough’s Blue Planet II brought attention to the blight of plastic pollution in the world's oceans everyone has been talking about it. Whilst gardening is perceived as very much a green pursuit, environmentally we gardeners use masses of plastic products in the pursuit of achieving our green oasis. Over the past few months we’ve seen some encouraging initiatives from the gardening trade to try and green up our plant pots. 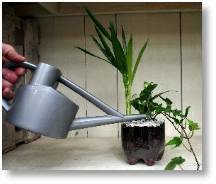 There are to be trials of a fully recyclable plant pot next year - the so called taupe pot - which if proves successful will be able to go into your plastic recycling bin, unlike the current standard black pot which isn’t recyclable from kerbside deliveries. 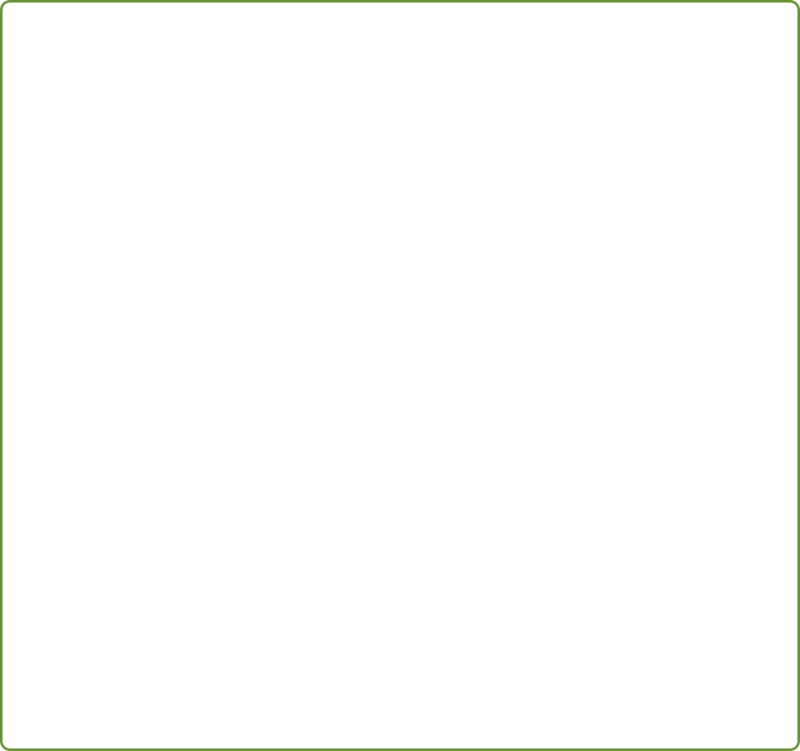 However, many local authorities are looking at this type of black plastic and we may see changes at some recycling centres accepting this type of plastic for the first time in the future. 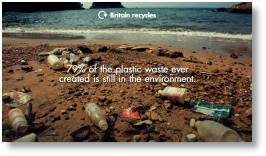 It may mean taking the black pots to your local recycling centre, but at least it is a start! Gardeners’ World presenter Monty Don has highlighted ways gardeners can become more proactive with his use of plastic at Longmeadow. 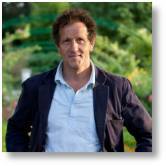 Monty demonstrated through this year ways gardeners can make a difference and has pledged to keep Gardeners’ World viewers updated on his programme, including any significant nursery trade developments. Monty reminds his viewers regularly on the importance of composting - surely one of the best forms of recycling we can do. We should be poised at this time of the year to start a new compost heap if we haven’t already done so. 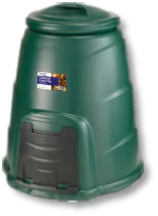 Buy a decent compost bin If you don’t fancy building a compost heap like the large ones you see in Monty’s or the Beechgrove garden, try a compost bin. They’re compact, so they’re perfect for smaller gardens. Location, Location, Location It’s best to site it on level, well-drained soil, which will ensure that any excess water drains away easily. This also helps worms to get in and get on with the job of breaking down the content. Let the worms do the hard work Nature has provided us with the perfect waste disposal unit in the humble worm. They can live their whole lives in the dark and love the moist atmosphere of a wormery or compost heap, eating the waste material you put in and converting it into liquid feed and compost. The brilliant tiger worm (Eisenia fetida) is the most efficient little worm we know, and loves nothing more than eating its way through organic waste. Choose the right stuff to put in Good things to compost include vegetable peelings, fruit waste, tea bags, soft plant prunings and grass cuttings. These are fast to break down and provide important nitrogen as well as moisture. It’s also good to include things such as cardboard egg boxes, scrunched up paper and fallen leaves. These are slower to rot but provide vital fibre and carbon and also allow important air pockets to form in the mixture. Crushed eggshells can be included to add useful minerals to the mix. Avoid the wrong stuff to put in Certain things should never be placed in your bin. No meat or dairy products unless you’ve opted for a digester. No diseased plants, and definitely no dog poo or cat litter, or babies’ nappies. Putting any of these in your compost will lead to unwanted pests and smells. Also avoid composting perennial weeds (such as dandelions and thistle) or weeds with seed heads. 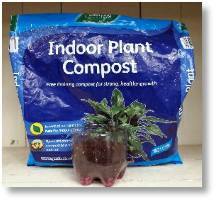 Remember that plastics, glass and metals are not suitable for composting and should be recycled separately. Get the balance right The key to good compost lies in getting the mix right. You need to keep your ‘greens’ and ‘browns’ properly balanced. 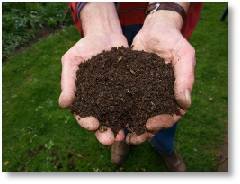 If your compost is too wet, add more ‘browns’. If it’s too dry, add some ‘greens’. Making sure there is enough air in the mixture is also important. Adding scrunched up bits of cardboard is a simple way to create air pockets that will help keep your compost healthy. Air can also be added by mixing the contents and regular ‘turning’ is advisable throughout the season. Give it a good airing A well-cared-for compost heap requires regular turning, which can be a tricky job so opt for a long handled fork if you can. 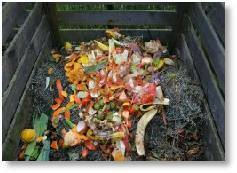 Turning your compost helps to aerate and mix up the waste materials, which leads to faster composting. hey can be left to turn into a brilliant source of moisture-rich soil improver that’s great to use for potting mixes as an alternative to peat. The leaves will be kept neatly in one place and the sack will biodegrade, leaving you with a rich pile of wonderful compost. Getting the best out of your compost When your compost is ready you’ll have a dark brown, almost black soil-like layer at the bottom of your bin. It should have a spongy texture and will be rich in nutrients. Spreading the finished compost onto your flowerbeds greatly improves soil quality by helping it retain moisture and suppressing weeds. It also reduces the need to use chemical fertilisers and pesticides in our gardens. PUZZLE CORNER - OUR NOVEMBER/DECEMBER CROSSWORD! Would you like to win a £25 Buckingham Garden Centre Gift Voucher? Enter our crossword competition below. Use the clues to fill in the answers. Take the letters from the shaded boxes which form an anagram of a popular ‘festive favourite’ plant (10). 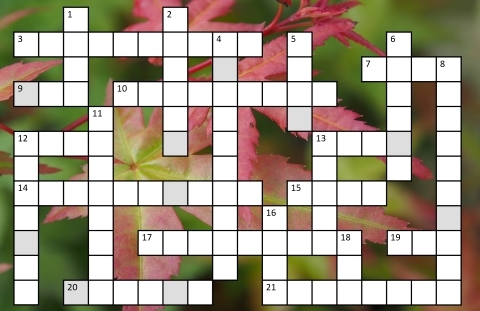 Once you have solved the anagram, send the plant name you have discovered by e-mail to competitions@buckingham-nurseries.co.uk with subject line “November Crossword” or post your entry to November Crossword Competition, Buckingham Garden Centre, Tingewick Road, Buckingham, MK18 4AE. Closing date 31st December 2018. The answers to previous crosswords are available on our website. The answers to last months crossword can be found HERE. Due to the fact that land prices have risen considerably over the past few years, new housing estates now often have houses with small or very small gardens and due to the proximity of other houses these can be overlooked by neighbours’ windows, writes Pauline Brown. As nearly all of us like to have privacy whilst out enjoying our garden the challenge is to provide the privacy but without taking up too much of the precious space, preferably as soon as possible. 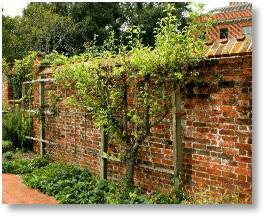 The obvious way is to erect some trellis above the close boarded fence which was provided, then cover this with fast growing climbers such as evergreen Honeysuckle, Montana Clematis, Russian Vine, Trachelospermum (Star Jasmine) or Virginia Creeper, but the danger of this is that high winds can sometimes bring such structures down. 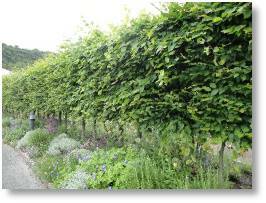 Less prone to wind damage is to plant and train a pleached hedge of, for example Hornbeam, so that it screens an area above the fence line, whilst leaving plenty of space below to plant an attractive border. The photo, above, shows such an effect outside one of the bio-domes at the Eden Project but this hedge is quite wide as it had not yet been cut back from its spring growth. 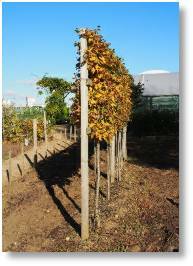 The photo, left, shows a three year old sample of pleached Hornbeam in the bare-root bed at the Garden Centre. This was achieved by building a wooden frame to act as a support whilst the trees were developing, then planting bare-root Hornbeam (Carpinus betulus) 150-175cm (5-6ft) at 1 metre (3ft) intervals along the line.  The spacing can be varied depending on how long you are prepared to wait for the screen. They were then grown on taking the leader out when the top height of the screen was reached. All branches growing backward and forwards were pruned out and branches running sideways were tied to the frame, weaving the branches together to make the screen. When tying it is best to use tarred twine rather than either plastic or wire as this limits the chafing problems. ‘Pleaching’ comes from the French ‘plessier’, which means to intertwine or plait. Hornbeam is not an evergreen but retains much of its foliage in the winter having turned from orange to brown, but if an evergreen screen is wanted this can be achieved using Photinia ‘Red Robin’ or Portuguese Laurel, but this will take a little longer, unless ready trained plants are purchased but these will be extremely expensive. Also as a semi-evergreen rather like Hornbeam, either Green Beech or Purple Beech can be used, both of these retaining copper coloured leaves in the winter. If it is felt that evergreen was not so important a very attractive screen can be achieved with Crab Apples or Fruiting Apples, the later bearing a delicious edible crop and both with beautiful blossom in the spring. 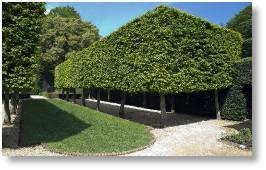 In both cases one would need to start with a maiden tree which will have a single, straight stem. Many other species can be recommended for pleaching. If you are interested in creating such a screen, the above is only a brief outline but more information is available by talking to a member of the plant team at the Garden Centre. Cherry (Prunus ‘Amanogowa’) a narrow ornamental cherry with its masses of semi-double pale pink flowers in spring and reaching an ultimate height of about 7.6 metres (22ft) but only 1.5 metres (5ft) wide. For an amazing splash of purple there is Malus ‘Aros’ (pictured above), a dwarf crab apple with shiny dark burgundy leaves, purple/pink flowers in spring followed by very dark red/maroon persistent crab apples. This only reaches about 3.6m (12ft) in height and is relatively narrow in form. If you are keen to grow fruit, pear trees tend to have an upright habit and with correct pruning will make a good screening tree and by choosing a variety which is reasonably self-fertile such as ‘Concorde’, ‘Conference’ or ‘Invincible’ you should get fruit even if there is not another pear in pollinating distance. So, if you have moved in to an otherwise perfect house but with the one problem of being overlooked, all is not lost, carefully chosen planting could easily solve this for you and we at the Garden Centre are more than happy to give advice. best photo from the previous week. The weekly winner will be announced on Facebook and will receive a useful £10 Buckingham Garden Centre voucher to spend instore. Our usual T&Cs apply. Prizes will be sent out by post. Please collect your Competition sheet from the Customer Service Desk and get searching on your next visit! You can create a simple terrarium from a fizzy drinks bottle. 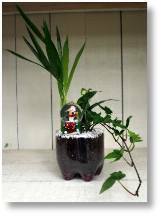 2-litre bottle, marker pen, houseplant compost, small plants (houseplants at this time of the year) or seeds, gravel/pebbles, sharp scissors and water. Turn a coffee mug upside down and rest your marker pen on top. 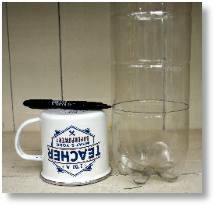 This will help you draw a straight line around the plastic bottle. As you place your bottle next to the marker pen, spin the bottle around slowly to draw the line. Take some sharp scissors and cut along the line. Later you will be putting the top half of the bottle back onto the bottom half of the bottle, so to make the top part fit better cut a little over 2.5cm (1-inch) slit down the side of the top section of the bottle. First fill the bottom of the bottle with some pebbles. The purpose of the pebbles at the bottom is to allow excess water to flow to the bottom of the bottle. This will prevent it from soaking the soil and making it muddy. Next you can add some soil. 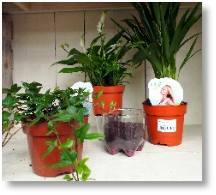 How much soil you put in depends on if you are planting a plant or seeds. Since we are planting small plants, we didn’t put much in. If you are planting seeds you will want to fill the bottom section with enough soil so that there is about an inch of space left to the top. Next add your plant, and add some more soil to fill in the spaces. If you are planting seeds opt for 6 to 10 seeds and later as they grow you can take out some of the weaker ones and leave 2 or 3 of the best ones. Next water your soil so that it is moist. Put the top on the bottom section to make a cover. While the cover is on look carefully at the soil in the ‘terrarium’. It should look moist but not soaked or too dry. Beads of water should form on the top inside near edge and these will run down the sides and continue to water the soil. If it appears to be too wet you can take the top off and leave it uncovered for a day or two. Once plants are growing well you can take off the cover. reduce isolation between populations. This also reduces the risk of local extinction. Across these areas we work with farmers, local authorities and other landowners to encourage wildlife-friendly land management. One of the greatest threats to wildlife is roads. 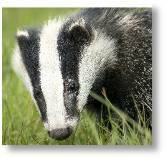 More than 50,000 badgers are killed on roads each year. It’s a road that is the focus of a legal case that BBOWT has launched against the government. 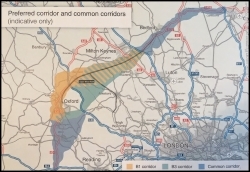 The Oxford to Cambridge Expressway and ‘Growth Arc’ will include a dual carriageway road and up to one million new homes. We are concerned that the government has chosen a corridor of land for this development that contains many sites that are protected for wildlife. During a consultation earlier this year BBOWT told Highways England – the government company that operates our motorways and major A roads – that ‘corridor B’ was the worst option of three that they were then considering. In September the government announced that it has chosen ‘corridor B’, but thankfully safeguarded some land in the middle, thereby saving RSPB Otmoor – an expansive floodplain to the north east of Oxford that is home to wading birds and wildfowl. However, many protected areas are still under threat. We are concerned about the potential impact on the Upper Ray Valley and ancient woodlands in the vicinity of Calvert, including Finemere Wood. The government also wants to build one million homes along the length of the Expressway, which could see the number of homes across Oxfordshire, Milton Keynes and Buckinghamshire nearly double. The current population of those three areas is very roughly 1.5 million, and the average number of people per home is 2.45, so there are currently more than 600,000 homes. Even if only half of the proposed new ‘Growth Arc’ homes are built across Oxfordshire, Buckinghamshire and Milton Keynes (and the other half in Bedfordshire, Cambridgeshire and Northamptonshire) it will still represent a near doubling of the current number. BBOWT launched a legal challenge to the government’s plans in September, making the case that they did not conduct a Strategic Environmental Assessment or Habitats Regulations Assessment before choosing ‘Corridor B’. There is also a lack of commitment by Highways England to preventing a net loss of biodiversity along the length of the development. If you are concerned please contact your local MP, and also District and Parish Councillors. If you would like to keep up to date with progress please see the web link below. EVERY SUNDAY Between 10am-3.30pm you can purchase a superb range of competitively priced fresh meat and poultry from Lee of Crawley’s Family Butchers from Brickhill. Unfortunately our vegetable stall is missing at the moment but we hope to have a replacement soon. WEDNESDAY 14th NOVEMBER at 4pm Designing A Border From Scratch with Lucy Hartley. This talk aims to guide the gardener who is faced with the prospect of turning a bare patch of ground into a new garden border. Lucy looks at the essentials, the pitfalls and the designer tips – old and new. She will start with good ground preparation through to ending up with plants which work well aesthetically for the onlooker and work well together for sustainability. The talk will begin at 4pm in the Talks Room in the Restaurant, as part of our Garden Centre talks programme, and will last approx 45 minutes with time for questions afterwards. To book a seat call us on 01280 822133. Garden Club Members free, £3 for non-members. WEDNESDAY 5th - FRIDAY 7th DECEMBER Willen Hospice will be joining us in the Foyer from 10am-4pm for awareness days. Willen Hospice is a charity which provides specialist care to patients and support for their families. SATURDAY 8th DECEMBER Cottage Garden Delight food tasting day. Plenty of tasty goodies to sample from our Christmas range of products. Taste before you buy! MONDAY 17th to SUNDAY 23rd DECEMBER Special Garden Card Event Week for our Garden Club Members with 10% discount across our Christmas department. SATURDAY 22nd to 23rd DECEMBER Berkshire, Buckinghamshire & Oxfordshire Wildlife Trust will be joining us from 10am-4pm in the Foyer. 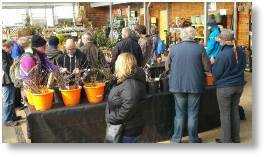 SATURDAY 2nd FEBRUARY 2019 is GRAFT AND GROW DAY Our apple scion wood exchange, grafting demonstrations and vegetable growing day will feature members of The Mid Shire Orchard Group offering an opportunity to swap scion (apple varieties) from wide and far and get them grafted (for a small charge), plus expert vegetable growing advice from members of the local National Vegetable Society. WEDNESDAY 13th MARCH 2019 at 4pm Twelve Months of Colour with Chris Day. This talk aims to encourage year-round interest into the entire garden, plus hints and tips on developing key plant associations to keep plant maintenance to a minimum. To book a seat call us on 01280 822133. Garden Club Members free, £3 for non-members.